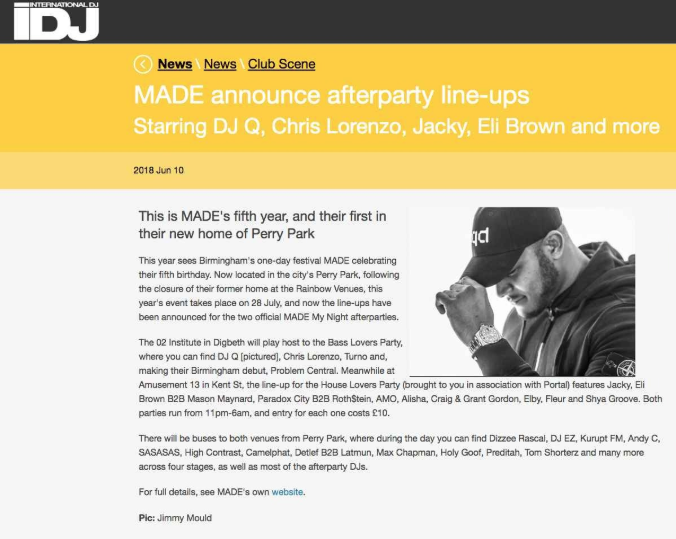 Some special afterparties have been announced for the fifth edition of Birmingham’s MADE Festival. iDJ announced the news, saying “The 02 Institute in Digbeth will play host to the Bass Lovers Party, where you can find DJ Q [pictured], Chris Lorenzo, Turno and, making their Birmingham debut, Problem Central. Meanwhile at Amusement 13 in Kent St, the line-up for the House Lovers Party (brought to you in association with Portal) features Jacky, Eli Brown B2B Mason Maynard, Paradox City B2B Roth$tein, AMO, Alisha, Craig & Grant Gordon, Elby, Fleur and Shya Groove. Both parties run from 11pm-6am, and entry for each one costs £10.